Staff Meeting Date: May 6, 2014. · Brief tour of school; ca.800 students + 56 teachers; intro. + welcome by headmaster. 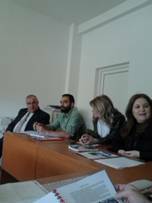 · Discussion about technical/vocational schools in RO + CY + student backgrounds + related social issues inherent to these student populations. Ø Promotion of these types of schools by the RO gov’t. because more jobs available in technical domains. Ø RO gov’t goal: 60% technical (vocational) vs. 40% theoretical (liberal arts) high schools. Ø The top three professions for which Reşiţa Technical High School provides training: mechanics; electricians, and; electronic technicians. 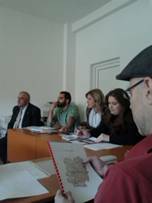 · Representatives from CY + FR interviewed about project and stay in RO by the local, national public radio station and by the regional television station; RO partner to send links to these shows. · Almost all deliverables (including all three newsletters) have been completed; the one outstanding deliverable is the Best Practice Guide (BPG), which is the final product. · Missing contributions for the practical part of the BPG from RO + ES. Once received, CY will edit and finalize the BPG. · Link to online transnational meeting evalution forms (https://drive.google.com/folderview?id=0B2oZELhQ9JYCbzkyVXoyOTRPNlE&usp=sharing) produced by ES should be accessed by all partners who should then fill out the relevant evaluation forms as soon as possible. · Review of the different parts of the final report; CY to send model text for the common part (Part A) to the other partners. · Reminder was addressed to all partners about the need to complete the EST database. Ask RO or CY for links to interviews broadcast on RO radio + TV for dissemination on websites + blog. Update project website with final version of Newsletter No. 3 + solve problem of blog spam commentary. Update project website with final version of BPG, once finalized by CY. Update website blog with link to recent IG event at the Town Hall of the 4th arrondissement in Paris. Ø PP: short report with photos related to cultural +/or IG learning experience in RO (visits, Revolution Museum, personal encounters, cuisine, etc.). Ø FP: short report on IG learning experience through games (for ex., Scrabble®) played in English. Update EST and produce Final Report by Sept. 30, 2014.